i’ve played around with shaders in houdini and pick up an old idea, which one of my last productions. a displacement shader for fracture pieces. this shader allows me to use pre-fracture geo and add extra displacement only in inside structure without adding high polycount to my geo. this works really good for concrete surfaces. this version of the shader displace also the edge on the cracks. this works good on dynamic fracturing. for pre-factured, i used a “forEach” node to acitvate the displacement on impact time, otherwise you will see the cracks before the impact. a while ago i did a setup in houdini for footdust and ground interaktion dust. i’ve created emitter geo from intersection of foot/object with the ground. a simple attribute transfer did the job. the dust direction is control by black cube on left corner. on my emitter ego, i’ve used a VOP-SOP network to add a velocity and noise to extra randomness into my emission. later on i wanna use the setup to created footprint on ground. in this case is just added infinite loop to attr transfer setup. loading the geo from the previs frame and merge it with the current frame. —> it creates a nice trail. this a good start for my footprint setup, which will do later on. its pretty simple setup for a interaction dust system, but its fast and flexible. it will work also with nice fluids setups. i´ve started a private project… i trying to build a action scene with a heavenly fluids driven character. the Inspiration comes form concepts books of warcraft tradings card (by blizzard entertainment) and dungeon and dragons monster books. here is the rig for the character, the shape of body are complete created with maya fluids. the rig controls every movment and extra keyable control´s for fire-speed, flamesize and extra release fire to get more expression out of the character. i´ve seperate the fire into 30 different fluids containers to keep the cache small and get more control over the character shapes, i also have reorganzied the caches-system to knock down the size of the caches files again for each shot. now, with cached fluids the character can easy animated and the viewport feedback is not too bad. which allows working in realtime speed including dynamics. the default transform and morphs for facial expressions looks to cartoon´y and unreal. to get around of this effect, i have used over 2500 expression for each character. every bricks, stone or wall peaces interacts itself. 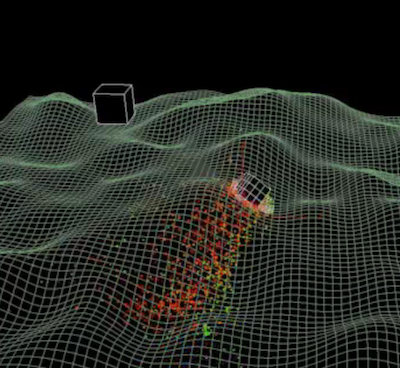 the simulation rig was connected to particle and fluids rigs for the rendering process. here you can see a test of a few facial settings of the stone character… the rig are able to connect to default facial-GUI of the studio. for this, i had only few rendered fishes as one layer. i´ve created the hole fishschool with one layer. i had “reused” the same layer a lot of time and change color,speed, movements to create a believable crowd of fishes. in the final dome theater the crowd swim around the camera/viewer. The destruction of an hotel building was done in maya and lightwave by my workmade pierre and me. 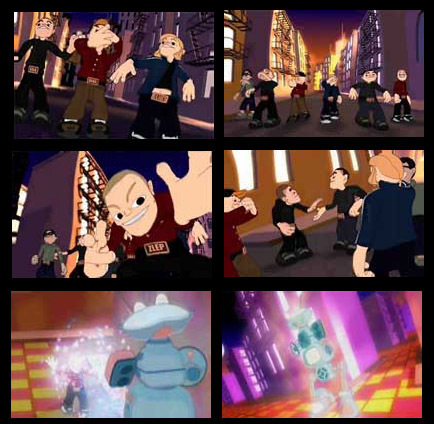 here are same shots from the “livi g beatbox “music video. it was on the cycle on MTV2. done by 5 man in 5 week.